You may believe that the destruction of the twin towers on 9/11 was an inside job (a surprisingly large minority of people do). The evidence regarding thermite alone is enough to convince any thinking person that the official story is a whitewash. What, government lie to us? No! But accepting such evidence is just the entrance to the rabbit hole. Actually, the twin towers were built to symbolize and project the power of the twin pillars of illuminized Masonry and and the ancient mysteries that they reference. This kind of thing is common in the architectural design, placement, and timing of the construction of spiritually, politically, or financially prominent buildings. 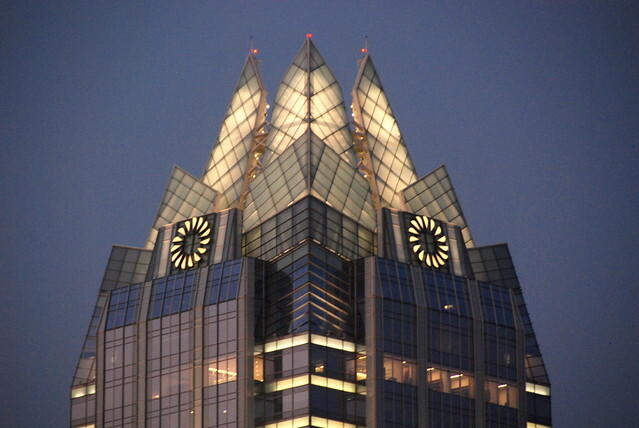 Consider the Frost Bank in Austin Texas. This depicts Molech as the owl – worshipped by the elite that meet at Bohemian Grove in California. The builders believe that their employees sit within the bowels of this building projecting the power of the entity which it embodies; and since they serve it, it blesses them. The building is not an anomaly but is part of a recurring theme. The twin towers were built representing the twin pillars of illuminized masonry for essentially the same reason. The group that does this kind of thing is organized and has been active for many generations. Consider Gandalf: Dee and the New Jerusalem. You could say it is an institution: a “mystery school”. It would be adherents of this school that built the Twin Towers as an embodiment of the power in their two pillars. In numerology this is represented by the “master number” 11. So is it coincidence that they were destroyed on 9/11? Hint: In numerology 9s drop out, leaving the other digits to stand alone. The date is no coincidence. The towers were built to embody and project the power of the mythic kingdom of gnosticism while they stood. And they were probably intended from the beginning to be destroyed and thereby release that power into the world in a special way when the time was right. You will have to admit that with their destruction and the resulting Patriot Act a new form of power truly was released into the world. Consider also the number 666 and the Boston Marathon bombing, and the hidden (occult) meaning woven into the Aurora shooting and the 2012 Summer Olympics ceremony (this will return you to the John Dee theme, mentioned above). If you review all this and don’t see that there exists a powerful and secretive network with an extensive reach, then you just don’t want to. So what is the meaning of the number 11? To me it indicates the duplicity of gnosticism crystallized in their belief in a dualistic pairing of meanings: the public and outward, and the private and occult. It indicates the gnostic drive to put forward their ultimate embodiment of world power: a world leader which will seem to be one thing outwardly but in reality will be another. This would be a sort of political false messiah. Sort of? Perhaps the bible is a prophetic book after all. Social media? Go where they pay you! Free sign-up, but you need an invitation so icliks invites you, below. Join the conversation at Tsu!